This past July I took a long road trip to visit 22 USA State Highpoints, the highest natural point of each of those states. This was part of my long-term project to visit the highpoint of every USA State. I began visiting USA State Highpoints in 1977 with my first summit of Mount Hood, the highpoint of Oregon. In 1979 I summited Granite Peak in Montana, and in 1980 I summited Mount Rainier in Washington. Perhaps I accepted the challenge of visiting all the Western USA State Highpoints in 1986 when I summited Gannett Peak in Utah, Boundary Peak in Nevada, and Mount Whitney in California. The states east of Colorado did not have any interest to me then, and the western state highpoints provided me plenty of challenge. With my summit of Denali in 1996 the original goal appeared reachable, though I was subsequently distracted by other activities for several years. I eventually resumed the project and finished visiting the Western USA State Highpoints in 2014 by summiting Mauna Kea in Hawaii. Meanwhile Linda and I had taken bicycling trips east where I opportunistically visited a few USA State Highpoints while there. Linda and I bicycled in Michigan in the summer of 2014. I drove our bikes out to meet her there and visited several state highpoints along the way out and back. I enjoyed seeing much more of the country than just the western states. It seemed to help me better understand and appreciate the diverse character of my country. I decided to try to visit the remaining state highpoints over the following years. I finally had an opportunity this July to take four weeks to drive as far as Maine and back from Oregon and visit most of my remaining state highpoints along the way. It was a successful and very memorable trip. My USA State Highpoints goal is now within reach. The first four USA State Highpoints I visited on this trip were in the Midwest in Iowa, Illinois, Indiana, and Ohio. The most efficient way to visit them seemed to be on my way east. Charles Mound is open to the public only four weekends each year and I planned my travel to arrive on the July weekend it was open. I left our Bend home on Thursday July 5 and spent the first two days reaching Nebraska. 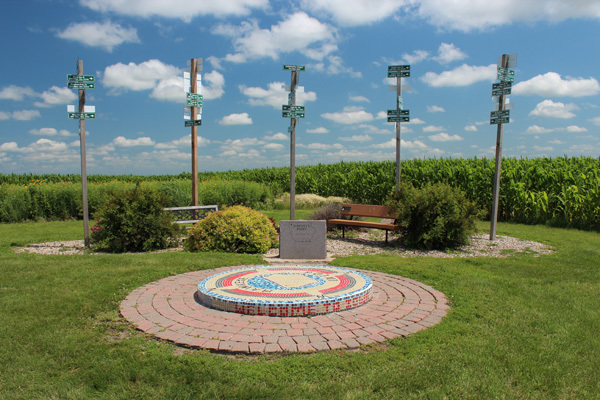 On the third day, Saturday July 7, I drove to my first highpoint of this trip, Hawkeye Point, at 1670 feet of elevation the highpoint of Iowa. I spent perhaps an hour here and then continued east through central Iowa. 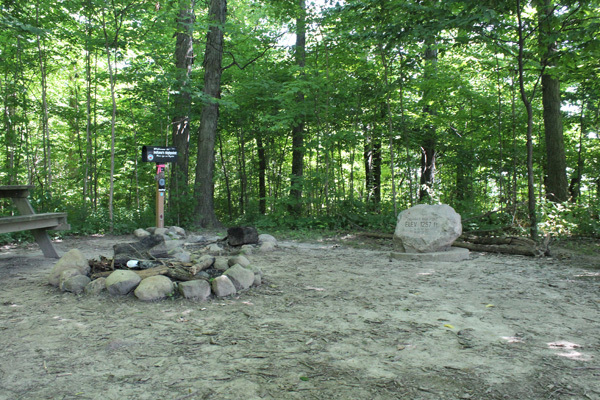 The next day, July 8, I visited Charles Mound, the highpoint of Illinois with 1235 feet of elevation. This was the Sunday of the only weekend of July it was open to the public. I parked along a country road and hiked up a farm road 1.25 miles to reach the highpoint. I was glad to stretch my legs after the long drive the past 4 days. After returning to my Jeep I continued east and camped at Illinois’s Kickapoo State Recreation Area. It was a warm and humid night. On Monday July 9 I visited two state highpoints. 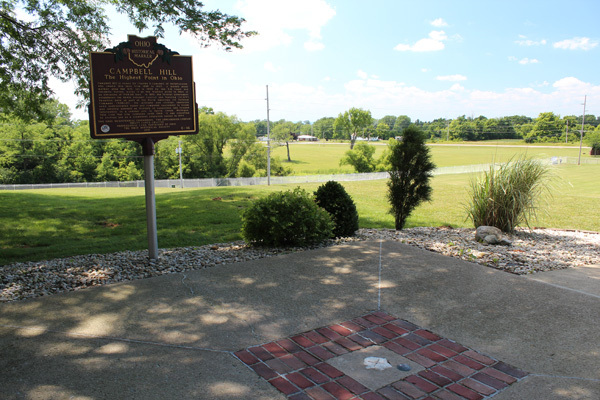 In the morning I visited Hoosier Hill, the highpoint of Indiana. It was a cool and shady spot in the woods next to corn and soybean fields. That afternoon I visited Campbell Hill, the highpoint of Ohio, and a former NORAD base. From there I drove northeast towards more interesting destinations. The highpoints of the Northeastern states were the highest priority of my long road trip. The highpoints of New York, Vermont, New Hampshire, and Maine were the most interesting peaks of the trip. I had some extra days added to my schedule to work around weather issues as need be to visit them. I spent Tuesday July 10 driving from Ohio through northern New York to Lake Placid. This was my first visit to the Adirondack Mountains and I thought the lakes were scenic. I scouted out the route to the Adirondack Loj and trailhead parking and planned an early start to the next day’s hike. 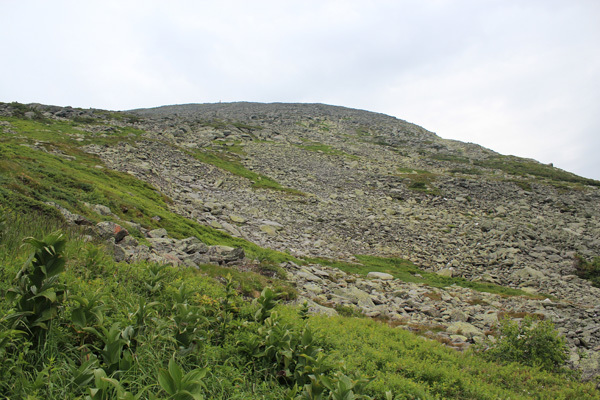 On Wednesday July 11 I hiked the Van Hoevenberg Trail to the summit of Mount Marcy. Mount Marcy is the highest peak in the Adirondacks, the highpoint of New York State, and with 4914 feet of prominence is the 58th most prominent peak in the Contiguous US States. I was happy to visit this important peak. The hike was 15.5 miles gaining 3200 feet up and down a very rocky trail. The last half mile of the hike was over rock slabs and the slopes had an arctic tundra appearance. I shared the hike up with another highpointer from North Carolina and we met a few other hikers as we climbed and at the summit. On the descent I met many other hikers and the parking lot was full when I returned. I was glad to have gotten an early start. The next day was a rest day. I did my laundry and restocked food. That afternoon I drove to Stowe, Vermont. From there I drove up to Smugglers Notch and on the return found the Long Trail trailhead. I planned another early start to the next day’s hike. 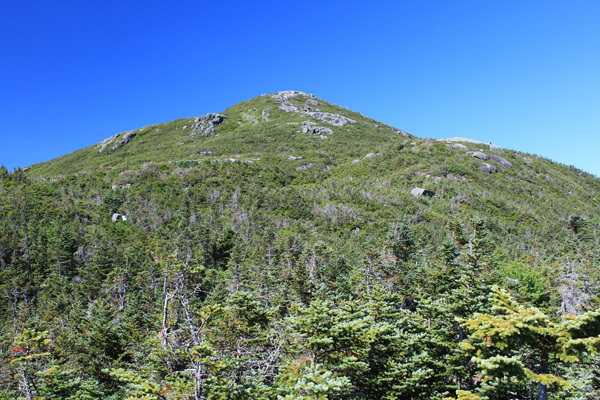 On Friday July 13 I hiked Mount Mansfield, at 4393 feet of elevation the highpoint of Vermont’s Green Mountains and the highpoint of Vermont. The Long Trail route climbed about 2900 feet in 3 miles. It was steep and rocky but mostly shaded, with the last few hundred feet leading up rock slabs and one short chimney. My lightweight mountaineering boots worked very well. I saw a few people on the summit and many others later as I descended. I was glad again to have gotten an early start. That afternoon I drove to Gorham, New Hampshire. The next day’s weather forecast was for clouds and showers high in the White Mountains. I scouted out the route to Pinkham Notch Visitor Center and planned another early start to the next day’s hike. 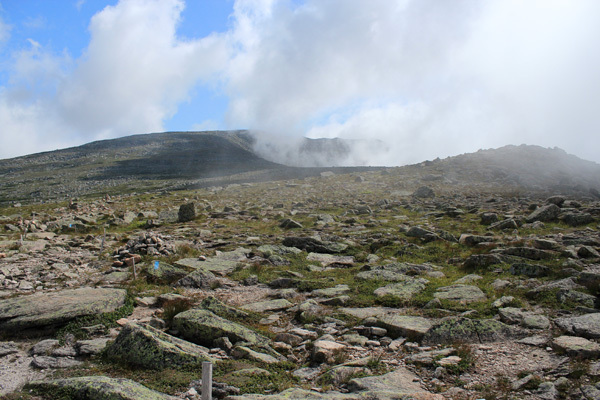 On Saturday July 14 I hiked Mount Washington, the highpoint of the White Mountains and the highpoint of New Hampshire. Mount Washington has 6288 feet of elevation and 6148 feet of prominence, making it an “ultra prominence” peak and the 38th most prominent peak in the Contiguous US States. So Mount Washington is a special peak, indeed. I hiked the Tuckerman Ravine Trail passing by the Hermit Lake Shelter on the way. The trail had a couple of detours and the round trip was 8.8 miles with 4300 feet of gain. I was passed by many hikers, but my early start got me ahead of the heaviest crowds. The trail worked it’s way up steep slopes in the ravine and traversed above cliffs and waterfalls to a broad saddle above. 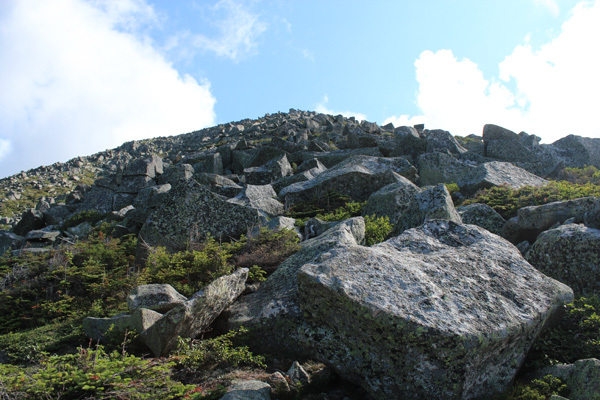 The last 0.8 mile to the summit was up a broad slope over large rocks. The upper slope was breezy and occasionally in clouds and light drizzle. The summit reminded me of Pikes Peak with a road, a cog railroad, a visitor center, and lots of people. Unfortunately, the views from this ultra prominence peak were obscured by clouds and drizzle. As I began my descent I was surprised to see a nearly continuous line of hikers climbing towards the summit. For a moment it reminded me of a weekend day on Mount Hood’s Hogsback. I heard pieces of many French conversations as I passed those heading up. The weather gradually deteriorated with more clouds, continuing breeze, and more frequent drizzles. Once I got below most upward bound hikers the trail grew quiet and few hikers passed me as I descended. I was very pleased to have succeeded hiking Mount Washington. My next goal was Mount Katahdin, the highpoint of Maine. I had camping reservations for Abol Campground in Baxter State Park for July 17 and 18 and my original schedule was to climb Mount Katahdin on July 17. However, the Mount Katahdin weather forecast for those days was for heavy rain. 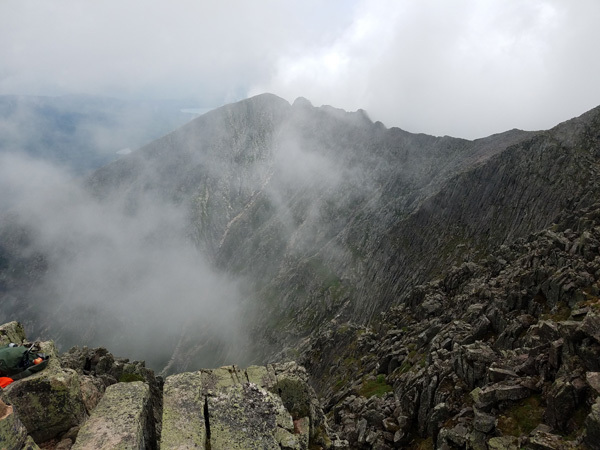 Since I had an extra day in reserve after hiking Mount Washington I decided to try to catch a window of good weather on Mount Katahdin the day before, July 16. So after hiking Mount Washington I drove that afternoon and the next day to Millinocket, Maine. My camping reservation was for July 17 and 18 but I hoped to get a parking permit for Baxter State Park on July 16. That afternoon I drove to the Togue Pond Gate and spoke to the ranger there about how to maximize my chance of getting a permit to enter the park the next morning. I needed to be in line at the gate before 6 AM. I rose early on Monday July 16 and got in line at the gate about 5:30 AM. Several cars were already ahead of me and I wished I had gotten an earlier start, but I was early enough to get the parking permit after all. I drove to the Abol Campground, found a parking spot, and started up the Abol Trail. The morning started with clear skies. A moose crossed the trail behind me as I took a break lower on the Abol Trail. Above that the trail included about 1000 feet of climbing up boulders but was generally well marked and I shared the trail with several others. As I climbed clouds began to build which encouraged me to keep my pace up, but no thunderstorms developed. I reached Baxter Peak, the summit of Mount Katahdin, in variable clouds. Mount Katahdin has 5268 feet of elevation and 4288 feet of prominence, making it the highpoint of Maine and the 105th most prominent peak in the Contiguous US States. Baxter Peak is also the northern terminus of the Appalachian Trail and I shared the summit with many celebrating thru hikers. I returned to the Abol Campground and camped at my reserved site. I relaxed and celebrated my summiting of these four important peaks. The next morning heavy rain began and I decided to abandon camp and move on south. I drove through heavy rain to Brattleboro in southern Vermont. The highpoints of Massachusetts, Connecticut, Rhode Island, New Jersey, and Delaware are located in a high population density region and I hoped to visit all of them so as not to need to return. During this time Linda arrived to finish her project of bicycling all the USA States. I had carried my bike on the drive for her to use and to simplify her logistics. The rain had ended by the morning of Wednesday July 18 and I hiked Mount Greylock. 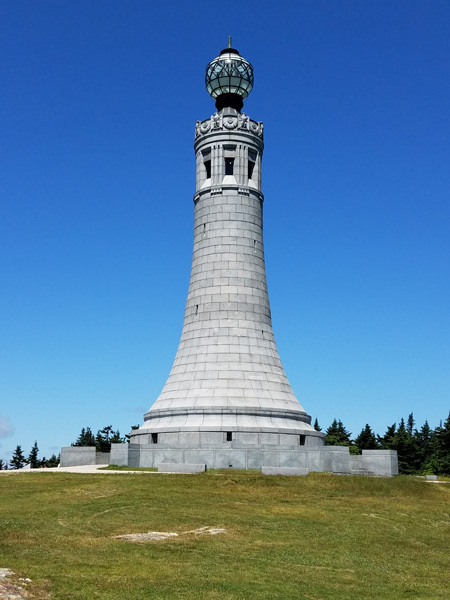 Mount Greylock has 3487 feet of elevation, making it the highpoint of Massachusetts. It also has 2463 feet of prominence, a P2K. It was a warm day, but mercifully the steep Thunderbolt Trail was almost all shaded with a nice breeze to help cool me when I paused on the ascent. Eventually the trail intersected the Appalachian Trail and I followed that south to the summit.The summit has a war memorial tower with an inside spiral staircase leading to a viewing room. A road provides an alternative route to the summit for cars and bicyclists and other trails are less steep, but the Thunderbolt Trail called me and rewarded me with solitude. That afternoon I drove to New Yorks’s Taconic State Park and reserved a campsite for two nights. The campground was sparsely populated, but was going to be full the upcoming weekend. On Thursday July 19 I drove to the AMC parking spot near the Massachusetts/Connecticut state line. 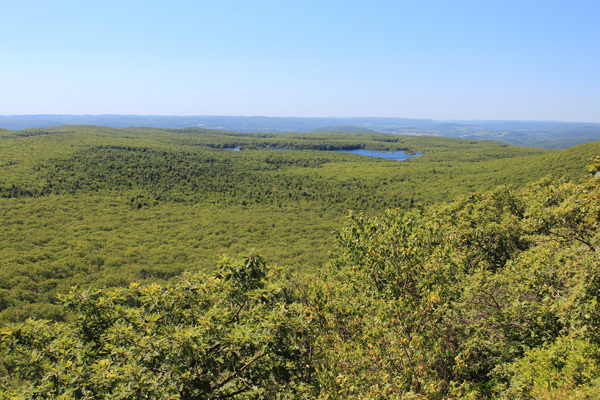 From there I hiked over Round Mountain, Connecticut, to the summit of Mount Frissell, Massachusetts, then dropped down Mount Frissell’s south slope to find where the Connecticut/Massachusetts border defined the highpoint of Connecticut. The mountains here are covered in mostly oak mixed forest with very thick brush, so I was fortunate to have a well-marked trail to follow. 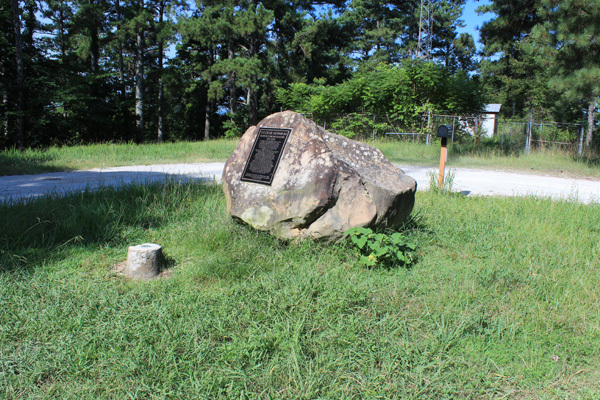 This highpoint is one of two USA State highpoints with zero feet of prominence. It was a clear day with pretty views and I had the hike all to myself. I returned to Taconic State Park and relaxed after a successful day. On Friday July 20 I visited two state highpoints. In the morning I drove to New Jersey’s High Point State Park. This scenic park is located on the long ridge of Kittatinny Mountain in the far northern corner of New Jersey. 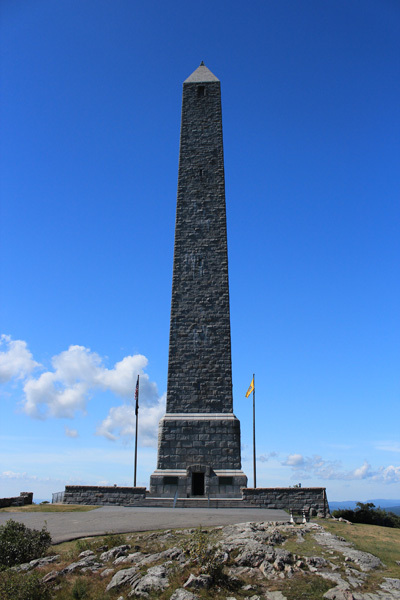 The High Point Monument, a war veterans memorial, stands on the highpoint of this ridge and with 1803 feet of elevation this point on the ridge is the highpoint of New Jersey. I walked the short distance from a parking lot to the monument tower, then climbed the tower’s interior stairs up 291 steps to just below the top point of the tower. The park is very popular on weekends but was uncrowded this day. In the afternoon I drove back across New York and Connecticut to the Rhode Island state line and visited Jerimoth Hill, with 812 feet of elevation the highpoint of Rhode Island. 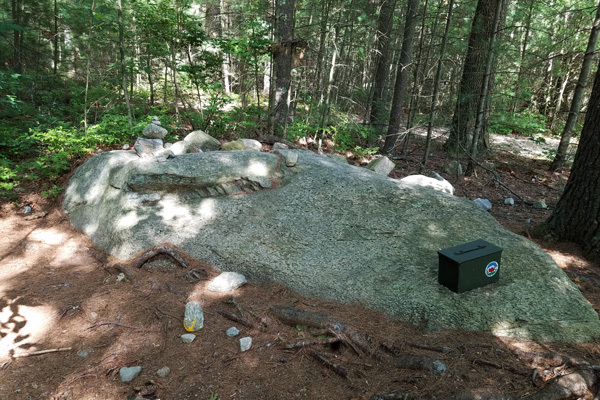 A short forest trail leads from a busy county road past a USGS “station” mark and a USGS “reference” mark to reach a secluded site beside a rock with a rusty chair and an ammo can holding a registry. It seemed to feel like a shrine. The next day, Saturday, was a bonus day. I did my laundry, scouted Linda’s bicycle route for the next day, and drove to Windsor Locks, Connecticut, to await Linda’s arrival the next morning. Linda arrived Sunday morning, July 22, at Bradley International Airport (BDL). 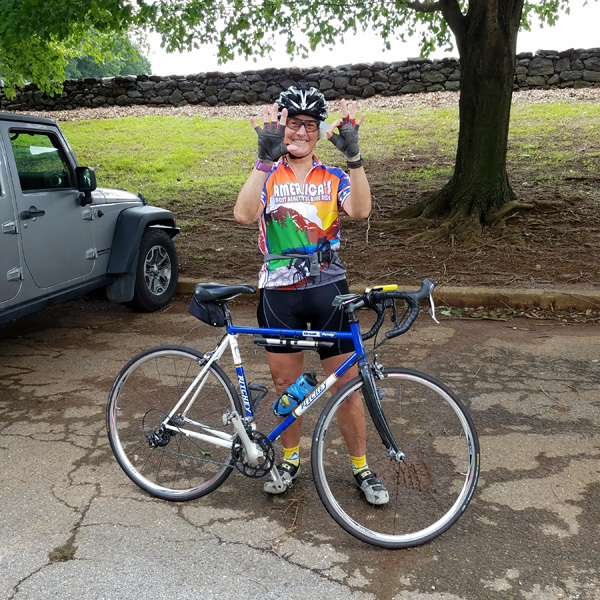 Over the next three rainy days Linda rode my bike in Massachusetts, Rhode Island, Connecticut, New Jersey, and Delaware, completing her project of bicycle riding in all 50 USA States! On the third day, July 24, I also visited Ebright Azimuth, with 442 feet of elevation the highpoint of Delaware. I honestly can’t think of much to commend it beyond it being a US State highpoint. It is beside a residential street and completely without any solitude, scenery, or wildness. 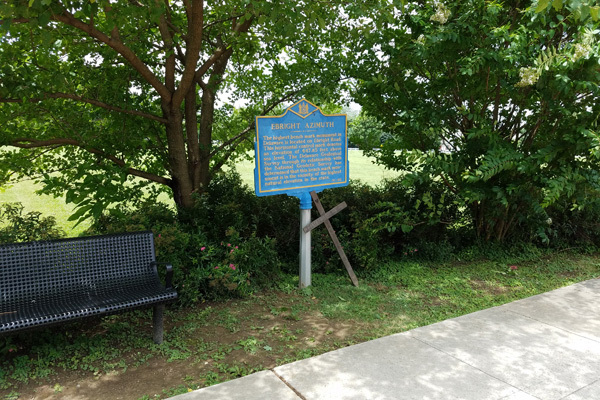 At least Delaware has placed a plaque there to note its existence. Ebright Azimuth is beside Ebright Street. There is a traffic constriction there to reduce the chance of careless highpointers getting run over, I suppose. Technically, the highpoint of Delaware is a few hundred feet away under a trailer/manufactured home. But the State of Delaware and the Highpointers Club recognizes this spot as the highest and asks visitors not to trespass reaching the higher spot. Hence the phrasing of the plaque. On Wednesday morning, July 25, I dropped Linda off at Philadelphia International Airport (PHL). Heavy rains and thunderstorms delayed her flight and she would not return home until the next day. Meanwhile, I drove west across Maryland under clouds and occasional heavy rain. I eventually turned north and drove to a parking area below the summit of Mount Davis. The rain turned to a light drizzle and I walked a short distance to the summit of Mount Davis. Mount Davis has 3213 feet of elevation, making it the highpoint of Pennsylvania. 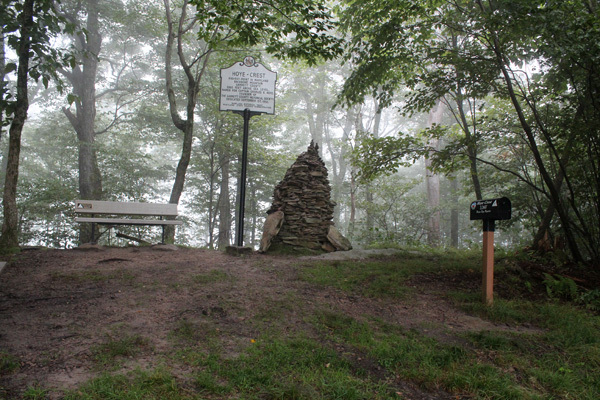 The summit of Mount Davis has several plaques describing the history of the mountain. Views at the summit were obscured by forest, but I carefully climbed the wet observation tower steps and got better views, though quite limited by clouds. After visiting Mount Davis I turned south through Maryland and entered West Virginia. I parked beside a highway and hiked up a primitive road and a trail back into Maryland to reach Hoye Crest, the summit of Backbone Mountain, with 3360 feet of elevation the highpoint of Maryland. I moved quickly to make the most of a pause in rain showers in the early evening. After a few photos at the summit I returned to my car and observed promising clearing skies and sunset colors. Thursday morning, July 26, I visited Spruce Knob, the summit of Spruce Mountain. With 4816 feet of elevation, Spruce Knob is the highpoint of West Virginia. 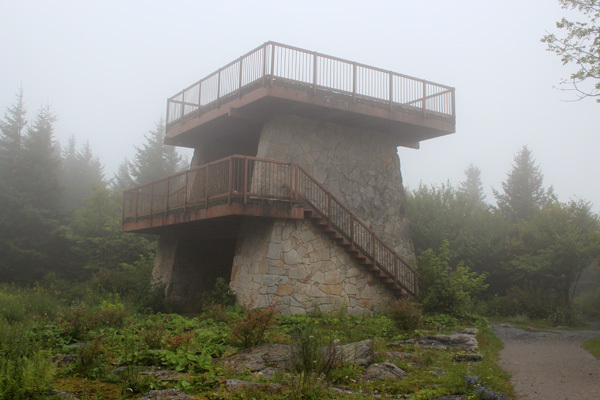 I drove up a long, single lane, paved road to near the summit, where a short trail lined by red spruce and sandstone blocks led to the summit benchmark and observation tower. The summit area was clouded in while I was there, so distant views were not available. I followed the Whispering Spruce Trail as it wound around the summit area and enjoyed the foggy and solitary atmosphere. A white fungus appeared in patches that reminded me of freshly fallen hail. I returned to my car and started the road descent out of the fog. distant views to the west and east opened up. That afternoon I drove to Grayson Highlands State Park in Virginia and found a nice campsite at the campground. It was a pleasant evening. 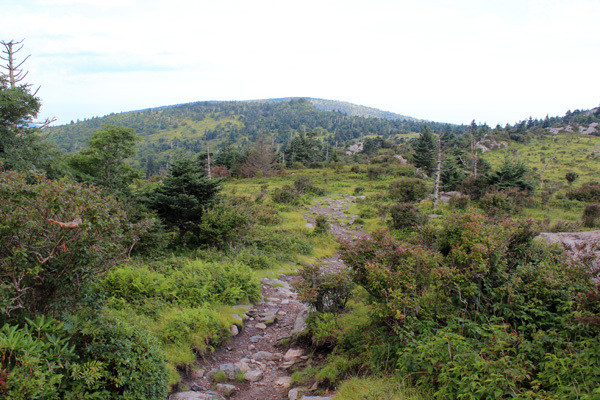 On Friday morning July 27 I hiked up Mount Rogers from Massie Gap. Mount Rogers has 5729 feet of elevation, making it the highpoint of Virginia, and 2489 feet of prominence, making it a P2K. 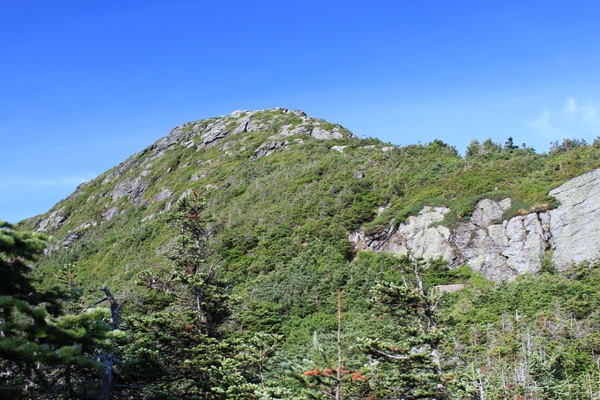 The hike was about 8 miles round trip, up and along the mostly open Wilburn Ridge on the Appalachian Trail, then finishing to the summit on a spur trail through dense forest. 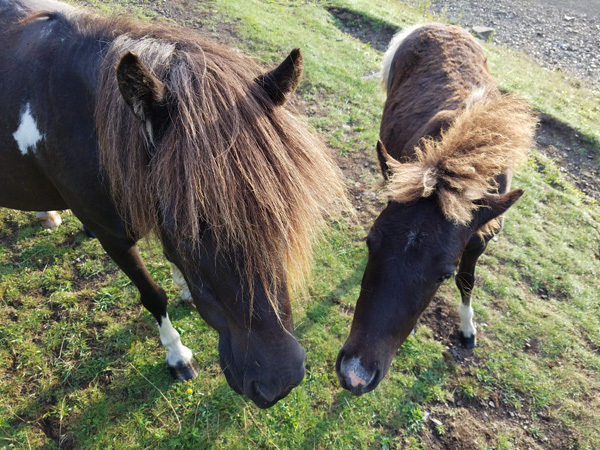 I met the famous semi-wild Shetland ponies on Wilburn Ridge. These ponies were introduced years ago to control the spread of native shrubs and trees. They are managed by the Wilburn Ridge Pony Association. 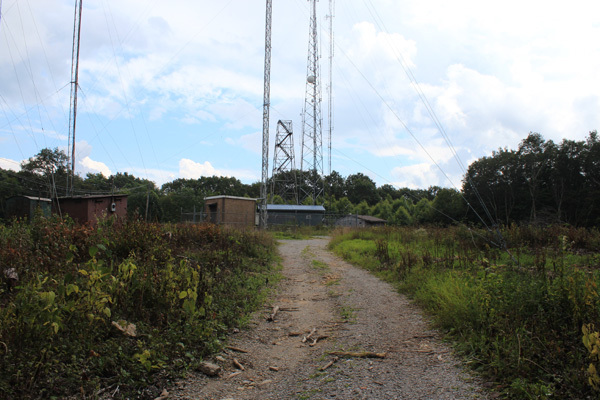 After hiking Mount Rogers Friday morning I drove northwest to near the Kentucky/Virginia state line, then up a primitive road past a FAA Long Range Radar Facility. I parked below an open gate on a narrow road and hiked a short distance to the summit of Black Mountain. Black Mountain has 4139 feet of elevation, making it the highpoint of Kentucky. The summit has several communication towers and a decommissioned lookout tower. 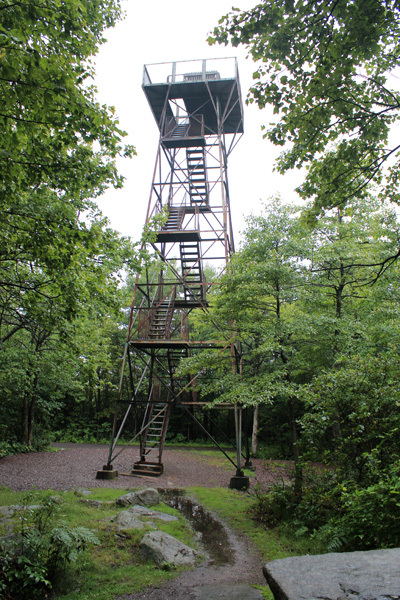 The summit lies beneath the lookout tower, where a benchmark labeled “RADAR” is located. There were no scenic views from the summit and I did not linger long. The next day, Saturday July 28, I and several hundred other people visited Clingmans Dome in the Great Smoky Mountains National Park. 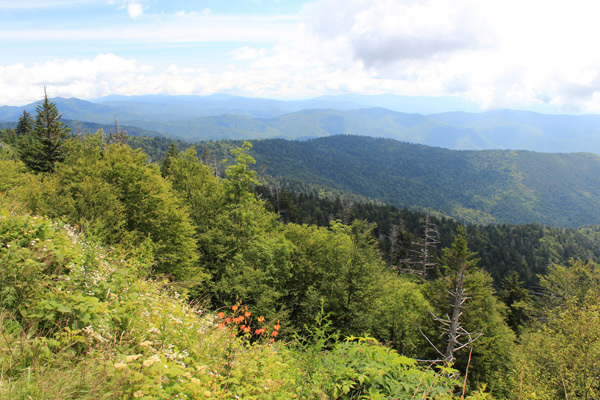 Clingmans Dome has 6643 feet of elevation and lies on the Tennessee/North Carolina state line. This makes Clingmans Dome the highpoint of Tennessee. North Carolina also has higher Mount Michell, so Clingmans Dome is not also the highpoint of North Carolina. 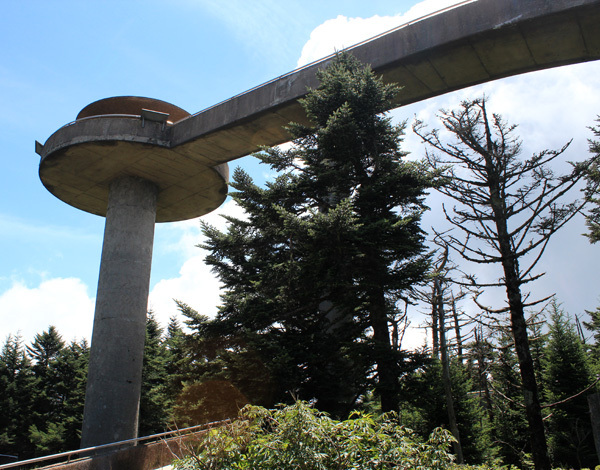 Clingmans Dome also has 4503 feet of prominence, making it the 85th most prominent peak in the 48 contiguous US States. The traffic was very heavy in the park. After finally getting a parking space I walked the steep paved trail to the summit area below the observation tower. The tower was closed for repairs, otherwise it would have provided fine views of the surrounding mountains. I did have nice views to the southeast and the southwest on my walk. I was impressed with the steep, forested slopes of the southern Appalachian Mountains. After visiting Clingmans Dome I turned to the west and started for home, spending that night in Alabama. Three additional USA State Highpoints remained for me to visit on this long road trip. 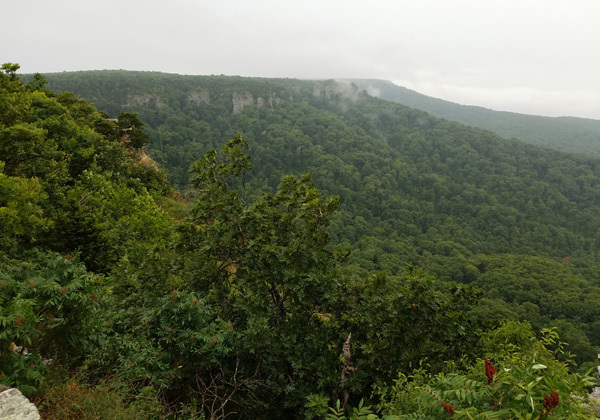 On Sunday July 29 I took a short drive off US Highway 72 up Woodall Mountain (once known as Yow Hill), with 806 feet of elevation the highpoint of Mississippi. The summit is surrounded by mixed pine and deciduous forest and radio towers. 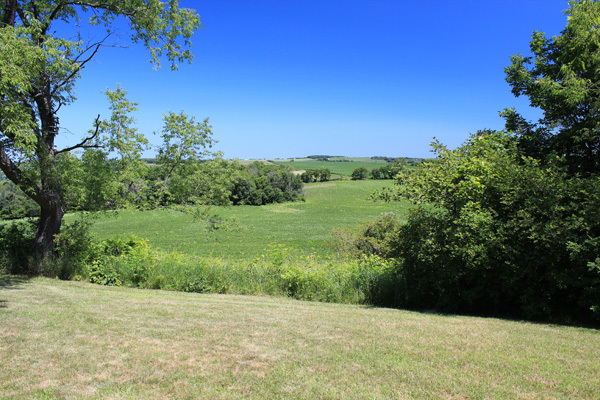 There were fierce and bloody Civil War battles near here in September and October 1862, but is now a pleasant spot to relax a few minutes on a long drive. I continued driving west into Arkansas. Monday morning, July 30, I drove to Arkansas’s Mount Magazine State Park and walked the nice Signal Hill Trail to the top of Signal Hill, the summit of Mount Magazine. It was lightly raining with occasional thunder but the thunder sounded high, perhaps from cloud to cloud lightning, and the summit was not exposed. I returned to my Jeep just before the rain became heavier. 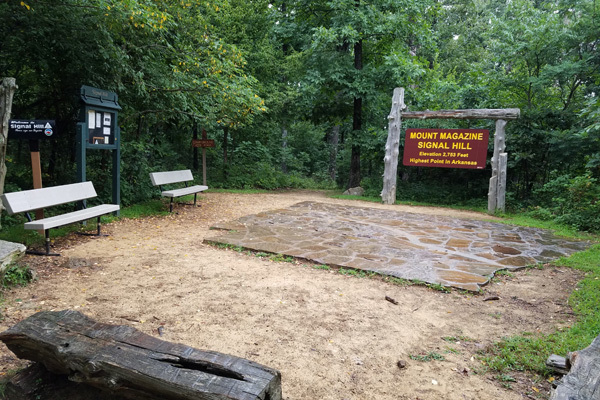 Mount Magazine has 2753 feet of elevation, making it the highpoint of the Ouachita Mountains as well as the highpoint of Arkansas. It has 2133 feet of prominence, making it the most prominent peak in Arkansas as well. I saw several deer on the drive in and one as I walked the trail. I stopped at the Cameron Bluff Overlook before leaving the park and enjoyed the view for a moment in the rain. Mount Magazine State Park is a lovely retreat and an important ecological resource for Western Arkansas. I spent the rest of the day driving west through most of Oklahoma. On Tuesday morning, July 31, I finished driving west across Oklahoma to near the community of Kenton near the New Mexico state line. I turned north and parked at the Nature Conservancy parking lot providing access to Black Mesa. From the parking lot I hiked about 8 miles round trip to visit the granite obelisk on Black Mesa marking Oklahoma’s highpoint. The highpoint has 4973 feet of elevation. 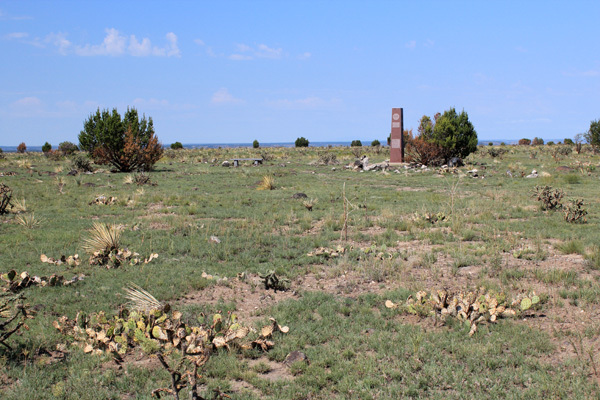 However, Black Mesa continues a very gradual climb into New Mexico and this highpoint is one of two USA State highpoints with zero feet of prominence. The obelisk documents that from its location Kansas is 53 miles ENE, Texas is 31 miles South, Colorado is 4.7 miles North, and New Mexico is 1299 feet West. The views were nearly identical in every direction. I met one person from Colorado hiking out as I hiked in, and I met a couple from Florida hiking in as I hiked out. I had the highpoint to myself. My hike of Black Mesa ended US State highpointing for me this summer. It was time to return home so I deferred visiting other peaks of interest to me on the way. There are so many peaks yet to visit! I have now visited 46 USA State highpoints in total. The four remaining highpoints for me to visit are those for South Carolina, Georgia, Alabama, and Florida. I expect to fly to Atlanta and rent a car some upcoming winter to visit them and thereby complete my USA State Highpoints project. This entry was posted in Climbing, Hiking and tagged Arkansas, Backbone Mountain, Black Mesa, Black Mountain, Campbell Hill, Charles Mound, Clingmans Dome, Connecticut, Delaware, Ebright Azimuth, Hawkeye Point, High Point, Highpointing, Hoosier Hill, Illinois, Indiana, Iowa, Jerimoth Hill, Kentucky, Maine, Maryland, Massachusetts, Mississippi, Mount Davis, Mount Frissell, Mount Greylock, Mount Katahdin, Mount Magazine, Mount Mansfield, Mount Marcy, Mount Rogers, Mount Washington, New Hampshire, New Jersey, New York, Ohio, Oklahoma, Pennsylvania, Rhode Island, Spruce Knob, Tennessee, Vermont, Virginia, West Virginia, Woodall Mountain. Bookmark the permalink.